If you're looking for the best bang for your buck when it comes to laptop hard drives, look no further than the 500GB Seagate Momentus XT. I picked one up as my internal media and backup drive to complement to my aging 80GB SSD. I have actually been rather impressed. Great performance (for an HD) and only $99. Let's explore. As I mentioned briefly at the end of this OS X Lion SSD TRIM post, the Momentus XT is not your ordinary laptop hard drive. I'm not one to like spinning disks but the Momentus XT is actually pretty slick: 32MB cache, 4GB SLC NAND memory, 7200RPM disk. It's a solid-state hybrid. The result of this combination of platters and NAND? 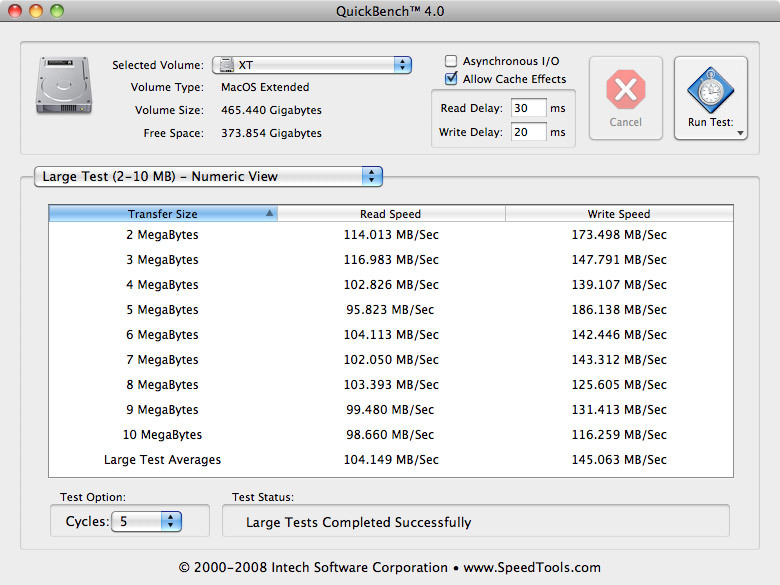 Average sequential reads exceeding 100MB/sec and average sequential writes near 100MB/sec. 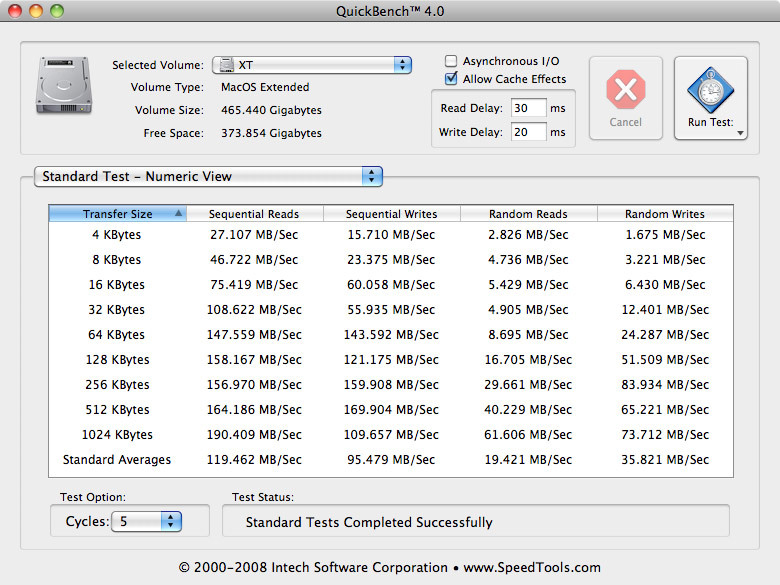 I had QuickBench run a few benchmarks across various transfer sizes. Results below. For comparison, current generation SSDs (broad generalization ahead) have sequential write and read speeds in the 200-300MB/sec range, with next generation SSDs closer to 500MB/sec. My first Intel X25-M SSD in late 2008 had speeds of 250MB/s read and only 70MB/s write. Of course, SSDs are best known for their random read/write performance. 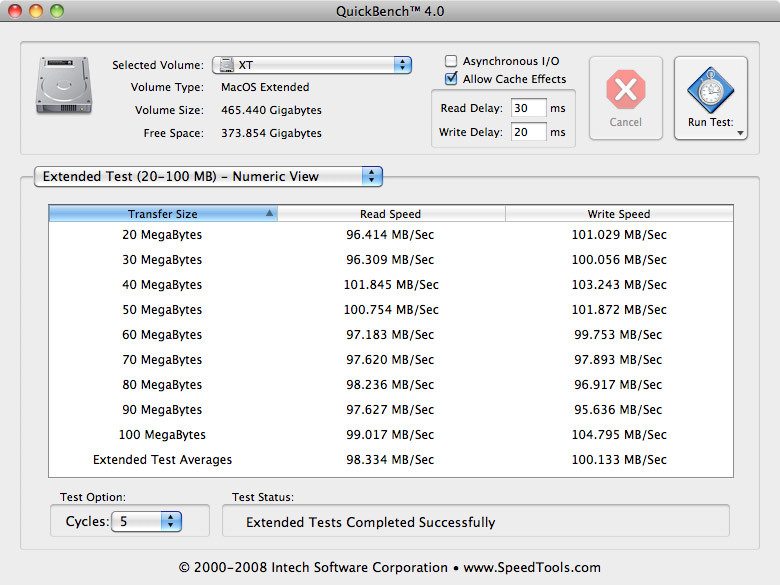 A comparable modern 2.5-inch 7200RPM 500GB laptop hard drive (not a hybrid) — take the Seagate Momentus 7200.4 for example — has average read speeds of 86.7 MB/s and average writes speeds of 76.5 MB/s. The Momentus XT's $40 price increase is definitely worth it for the performance. It should be noted that there is a recent firmware update (SD24) available for the Momentus XT that helps with certain issues. My drive shipped with this update but you should double-check when you get your drive. If using Mac OS X, click the Apple icon in the menubar » About this Mac » More info » Serial-ATA » then select the drive (might be listed as ST95005620AS) and look for the Revision field. 1 I should clarify, this rating based more on value than anything. If I had to use this drive as my main OS drive I would go crazy. I'm far too used to full-blown SSD speed. It's a great storage drive and that's how I use it. Great drive for an internal Time Machine backup.